PEACE HOUSE – The leaders of North and South Korea have vowed to “write a new chapter” in their peninsula’s troubled history marred by nuclear missile programmes and ballistic hairstyles. 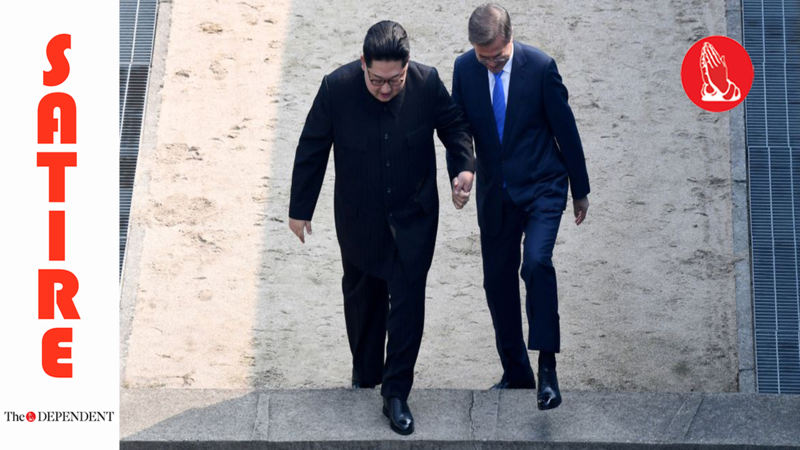 On a bright spring morning Kim Jong-un and his South Korean counterpart, Moon Jae-in, reached across a simple concrete slab marking the border between their countries and ran hands through each other’s hair for at least 20 seconds. A deadlock spanning over 75 years was finally overcome on Friday after South Korean President Moon Jae-in agreed to sport ‘the Kim’ in exchange for North Korean Supreme Leader Kim Jong-Un abandoning his country’s nuclear programme. Geopolitical analysts say the meeting, while highly symbolic in heralding a new era of hairpeace, would produce little of substance on denuclearisation, if it leads to proliferation of hairstyles mimicking Kim Jong-Un. “It’s high on symbolism, but you have to ask yourself aren’t you replacing one from of explosives that can pulverise the region, with another?” said Van Jackson, a former policy adviser to the US secretary of defence who focuses on Asia. Meanwhile, Japan’s defence minister, Itsunori Onodera, said Tokyo hoped the summit would lead to demonstrable progress. “Japan will be watching closely for signs that no nuclear hairdos penetrate its borders,” he said.